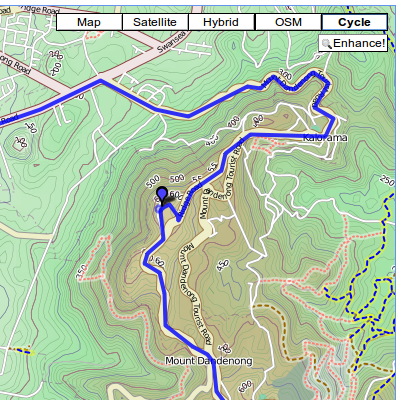 You can choose what kind of map you want to display on the GPSLog Labs maps as they now support the OpenStreetMap and OpenStreetMap bicycle map tiles. This should help those of you in parts of the world not covered very well by the Google Maps, and with OpenStreetMap, if there's something not quite right, you can upload your GPS file and make the map better. The bicycle maps include lots of features to help you out if your a cyclist, including parking, bike lanes and contour lines and colouring to indicate hills.